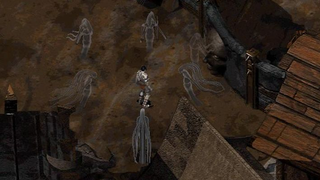 Like its nameless protagonist, Planescape: Torment might come back from the dead. Speaking to GamesIndustry.biz in an interview posted today, Obsidian co-founder and Planescape: Torment creator Chris Avellone said he's "very tempted" to start a Kickstarter to revive his beloved classic role-playing game. Although he'd ditch the D&D—and maybe even the setting, too. "I think the challenges we've spoken about would all have to be considered and to be honest I don't know if I'd want to do it as a Planescape game - I think a better approach would be to ignore the D&D mechanics and respect what Planescape was trying to do and what the game did and see if you can do what Fallout did when it became the spiritual successor to Wasteland," he said. "I think if you made a game using some of the concepts of Planescape, the metaphysical ideas and the plane travel, without using the D&D mechanics, you could actually come up with a much better game. With Torment, I'd argue that the D&D base actually, in places, got in the way of the experience. It was a lot harder to make a game with those ideas in it with D&D mechanics. So much that we had to break a lot of them. We had to ignore certain spells, change up the class mechanic so that you can switch at any time you like by remembering abilities. "That was stuff that D&D didn't allow for, it was [too] restraining in some respects. If we did do a spiritual successor, then I don't know if we'd use the Planescape licence or attach the mechanics, perhaps something that has a different feel to Torment." If we get characters as awesome as Morte the talking skull, I'm cool with whatever.